The Steelers and Jets were in a back and forth affair Sunday when in the second half, the Steelers defense finally put a stop to it. Led by Vince Williams, who had a team-high nine tackles (eight solo), including a sack, the Steelers D pitched a second half shutout, and rolled to a 31-13 win. The victory makes the Steelers 4-1, and for his tremendous effort Williams is our “Steelers Gab Player of the Week” for his play. It’s the second straight week that Williams led the team in tackles, filling in for the injured Ryan Shazier. Williams led a dominant second half D that didn’t let Jets QB Ryan Fitzpatrick do much of anything. The Jets, who had a big first half, were held to next to nothing in the final 30 minutes, with Williams leading the way. On the season Williams has 25 tackles and three sacks, and he and the team will look to continue their strong efforts Sunday when they play the Dolphins in Miami. 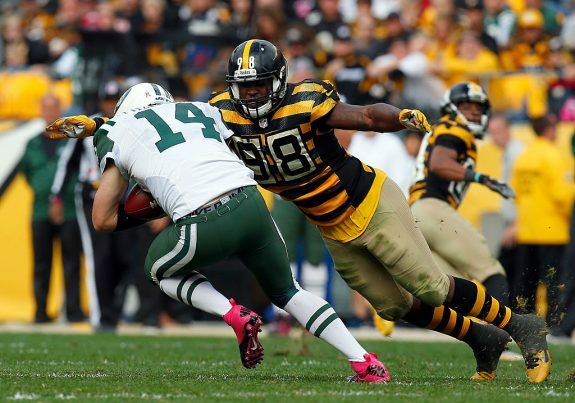 Be the first to comment on "Steelers Gab Week Five Player of the Week: LB Vince Williams"